The postwar era found North Carolina and other southern states ready to take on even more industrial development, as high wages, strong union influence, and declining protective tariffs reduced northern industries' ability to meet increasing foreign competition. Eventually, foreign competition would undercut even North Carolina's lower costs, but in the interim the state benefited as companies closed their plants in the North and moved them south. By 1976 nearly three-fourths of American textile production was concentrated in the South. Tobacco production also remained important through much of the early postwar period. By 1969 North Carolina was growing 51 percent of U.S. tobacco, and this gave the state a similar lead in tobacco manufacture. The state's furniture production flourished as North Carolina surpassed New York as the national leader, producing about 20 percent of the nation's total furniture products. As the end of the twentieth century approached, North Carolina manufacturing faced several new challenges. Free trade agreements were instituted with various foreign countries, particularly those in Latin America and Asia, giving North Carolina textile mills tremendous competition, and corporations moved many operations abroad, closing all but the most efficient plants. Between January 1990 and December 2001, the state lost more than 155,000 manufacturing jobs, nearly 100,000 of them in the textile industry. Environmental concerns brought accusations against many industries for polluting water and air resources, most notably in western North Carolina along the Pigeon River. Health concerns and legal action dealt the tobacco industry heavy blows, and tobacco manufacture dropped to sixteenth place among North Carolina manufacturing industries. North Carolina industries faced not only increased competition but also changes in the business climate. With most corporate stocks owned by institutions such as mutual funds and pension plans rather than individual investors, there was less interest in manufacturing itself and more interest in its profitability. Formerly, investors were willing to accept lower profits in stable industries, but institutional investors demand universally high profits from all businesses. To increase the bottom line, corporations downsized, often closing otherwise successful plants that were seen as relatively unprofitable. The 1990s were characterized by mergers of large businesses into even larger, more diversified corporations. In the process, more marginally profitable plants were closed and management functions consolidated, resulting in large layoffs among white-collar, middle-management executives in the 1990s. In addition, the state lost a number of corporate headquarters. Rising worldwide lumber prices and environmental concerns spawned wood chip processing plants that made more efficient use of valuable forest resources. Hog and poultry processing plants made North Carolina a major national supplier of hogs, chickens, and turkeys by 2000. Despite some economic struggles, the furniture industry was still strong, remaining the second-largest employer in the state, with approximately 70,000 workers. Companies specializing in telecommunications, pharmaceuticals, biotechnology, and other industries became important contributors to North Carolina's manufacturing economy. University Research Park in Charlotte and Research Triangle Park (RTP) in the Raleigh-Durham-Chapel Hill area brought to the state not only research endeavors but also light manufacture of electronic components and development of computer software and other telecommunications equipment. In 2006 IBM, Nortel Networks, Cisco Systems, and Sony Ericsson all maintained significant operations in RTP. RTP and the university research hospitals at Duke and the University of North Carolina at Chapel Hill also attracted major drug-manufacturing companies, including GlaxoSmithKline and Bayer Corporation, to the Triangle area. In 2006 the production of fabricated metal products, electrical and transportation equipment, chemicals, paper, rubber, plastics, stone, clay, and glass were all significant in the state. Major Charlotte manufacturers included Goodrich Corporation, a Fortune 500 company that produces aerospace components, systems, and services;SPX Corporation, makers of products as diverse as fire detection systems and freezer units for blood banks; Nucor Corporation, makers of a wide variety of steel products; and Sonic Automotive, Inc., one of the nation's largest automotive retailers. Other large North Carolina manufacturers included Greensboro-based VF Corporation (clothing and apparel), Winston-Salem-based Reynolds American, Inc. (consumer goods), and Raleigh-based Martin Marietta Materials, Inc. (stone aggregates for roadways and other construction) and Red Hat, Inc. (technology). 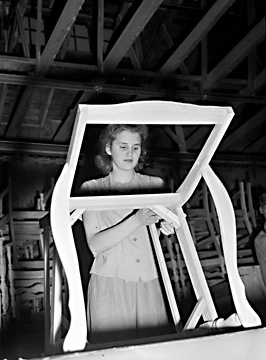 Lenoir Chair Company, Lenoir, NC (Caldwell County); final assembly and sanding, c.1943, photo by Patrick. From North Carolina Conservation and Development Department, Travel and Tourism Division photo files, North Carolina State Archives, call #: ConDev3171B. Available from http://www.flickr.com/photos/north-carolina-state-archives/2731911665/ (accessed October 2, 2012). 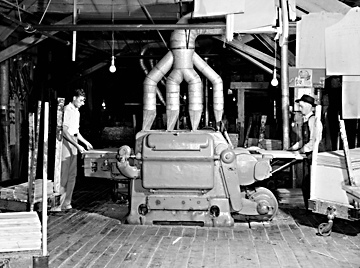 Jennings Furniture Company, Lenoir, NC (Caldwell County); Cutting, Boring, Automatic Sanding, 1940s, photo by Patrick. From North Carolina Conservation and Development Department, Travel and Tourism Division photo files, North Carolina State Archives, call #: ConDev3190A. Available from http://www.flickr.com/photos/north-carolina-state-archives/2731909583/ (accessed October 2, 2012). 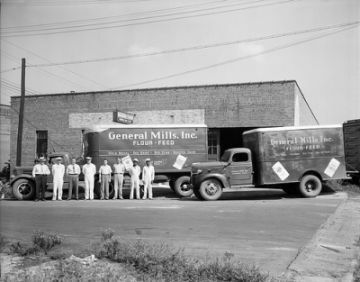 General Mills Trucks 1947 From the Barden Collection, North Carolina State Archives, N.53.15.6080. Available from http://www.flickr.com/photos/north-carolina-state-archives/3615043784/ (accessed October 2, 2012).